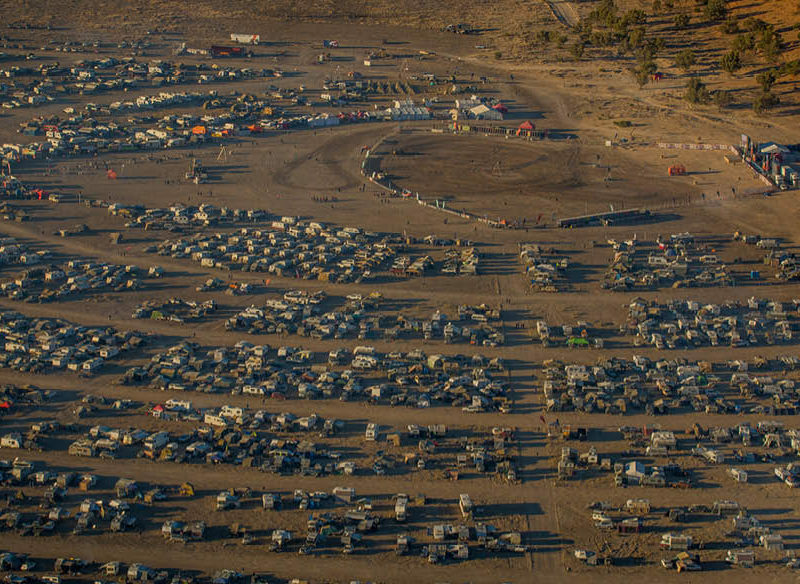 A bird's eye view of the Big Red Bash Festival in Birdsville. Getting to the three-day music festival widely acknowledged to be the most remote in the world takes a bit of work, but is it worth it? Dilvin Yasa takes a trip. My nine year old is wearing three coats, five tops, four pairs of socks and a beanie and she’s still shivering in our two-man tent as it nudges -2 degrees on the outer edges of the Simpson Desert where we lay our heads. “Why did you bring me here, Mum?” she demands to know, motioning at the sea of tents, caravans and vans parked outside our flap door. Discounting the Milky Way lighting up the desert sky above and the fact we’re on an outback adventure of a lifetime, I tell her I no longer know. “Just close your eyes darling and pray a pack of wild dogs rip us apart in the middle of the night so we don’t ever have to experience this cold again.” Tellingly, the thought of an imminent, yet oh-so-violent death seems to soothe her and I’m not far behind. By 3am, I’m fantasising about setting fire to nearby Winnebagos for warmth; by 5am, I no longer care about removing inhabitants of said Winnebagos first. The remoteness of this place will do it to you. We’re at Big Red Bash, Birdsville, outback Queensland, widely acknowledged to be the world’s most remote musical festival – a three-day extravaganza filled with iconic Australian artists in a classically Australian setting, located just 11 kilometres from the South Australian border on the eastern edge of the Simpson Desert where red dust from the 1,100 sand dunes whir endlessly and ‘Buy me a another beer, you’re still ugly’ posters line the walls of local pubs. Having grown significantly since its inception in 2013 when John Williamson was the only headlining act, this is the first year it’s sold out of all 9000 tickets, each Aussie music fan keen to see the likes of this year’s headliners John Farnham, The Angels, Daryl Braithwaite, Hoodoo Gurus and Jon Stevens. Upon approach, the scene can be confronting if you’re not the usual ‘festival and camping’ type: there’s a sea of tents and caravans – many with Australian flags proudly flying on top. Kids young and old are either sand boarding or simply hurling themselves down Big Red, the dune that hosts the festival, as brochures being handed out reveal a long list of activities from whip cracking and the aforementioned dune surfing, to shopping and eating from the 14 food trucks stationed well away from the stage. Can carb-eating be classed as an activity? From the looks of the pizzas, burgers and meat pies on offer, I’ll add it to the list. The Big Red Bash Festival coming to life as the sun sets in Birdsville. The camping facilities at Big Red Bash Festival, Birdsville. Plenty of characters at Big Red Bash Festival, Birdsville. Dare I think that’s any kind of highlight, the morning drag race from the top of Big Red kicks off the festivities, closely followed by a drag fashion show, where big burly men dress up in the most colourful of outfits and dance on stage, their hairy underarms and bellies serving up big laughs from the crowd. Some are dressed like the Queen – skirts and toilet paper tucked into their undies, one’s in a lime green mankini, and the duo who win it – Pricilla complete with large tour bus – have travelled up from Tasmania just to partake in the action. Rocking out at Big Red Bash, Birdsville. As the day continues, musical acts come on and musical acts go and while there’s a quiet joy to be had in settling into your camp chair with your esky at your feet, the real fun seems to be wherever there are plenty of festival-goers ready for a chat. High on the sand dunes, we share cheese, crackers and wine as we watch the sun set. Over by the food trucks, we sit, deep in chatter, while we wait an impressive two and a half hours for our pizza to be ready (on the bright side, it really was very good), and later at night as the chill sets in once more, we huddle in and tell tales of travel, warmth and friendship as the likes of Jon Stevens and John Farnham sing their hearts out. No, I’m not a festival person and I’m certainly not a camping person, but there’s nothing I love more than hearing stories about lives, hearts and longing. If we leave it at that, it was my kind of event, and what’s more, it was held right in the middle of some of the most spectacular scenery you could ever hope to see. What could be better than that? 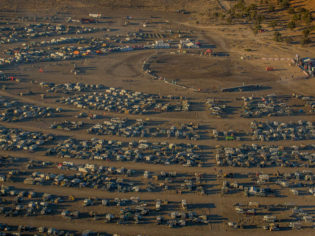 A birds eye view of the Big Red Bash Festival, Birdsville. The deserted terrain at the Big Red Bash festival, Birdsville. To book tickets for Big Red Bash 2019, or for further information, visit Big Red Bash.